For much better photos, see here for Rockwarblers (sometimes spelt as one word) and here for White-browed Scrubwrens. Another windy day meant Northface jackets on while we were on the ridges. Out of the wind and climbing down the Giant Stairway we definitely warmed up enough to warrant taking that layer off. Too much steeper and this would be a ladder! Reaching Dardanelles Pass Walking Track we turned left this time, heading towards Leura. The beautiful forest, thick in parts with bird calls, just got more and more beautiful the further we walked. Right beneath the cliffs my Garmin was constantly letting me know it was having trouble finding satellites (so I’m surprised that there’s anything remotely sensible on the map above, even though that’s Stephen’s data again) but I didn’t really care at that point. The cliffs, so close and towering above are magnificent. The boulders you pass are a reminder that things larger than pebbles occasionally fall from the heights – although, by the extent of moss covering the rocks, there haven’t been any recent falls. Walking along here I experienced feelings of utter bliss, awe, tranquility and harmony – that was probably aided a great deal by the fact that there was no one else around. I didn’t even know how far ahead Stephen was. I wanted to hurry to catch up – yet at the same time I wanted to slow down and savour this almost spiritual experience, too. The forest was so green! 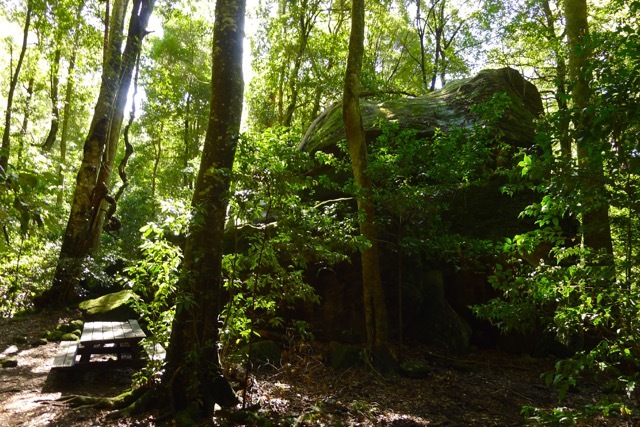 Slow down and watch the small birds on the forest floor hop over the logs and flit over rocks to hunt out insects. See the fungi helping to break down the dead wood and return nutrients back into the earth. 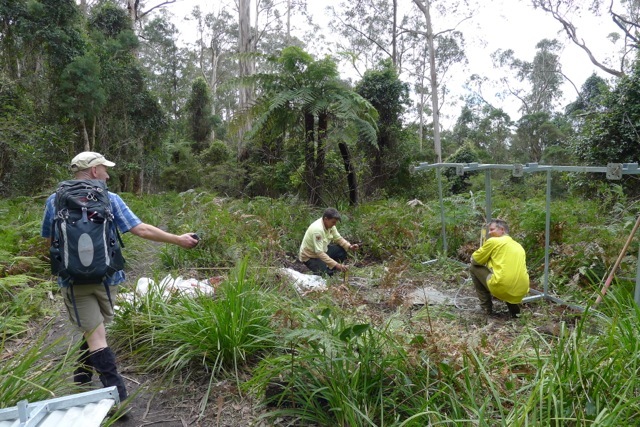 There are plenty of lyrebirds too, who turnover the forest floor, like a gardener with a hoe, as they dig for invertebrates. It’s an amazing place, and we are privileged to be able to share it, as it’s part of a National Park. To be able to walk through it in peace and quiet was really something special. 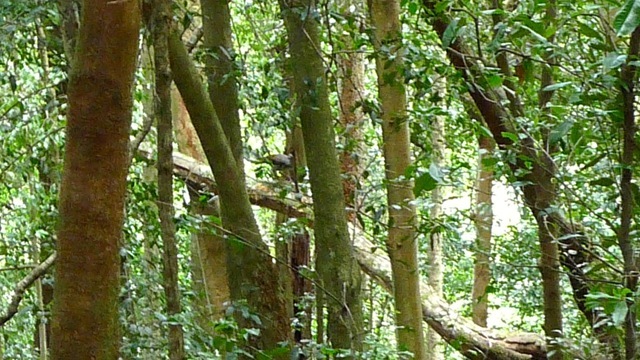 Can you spot two white-browed scrub wrens here? 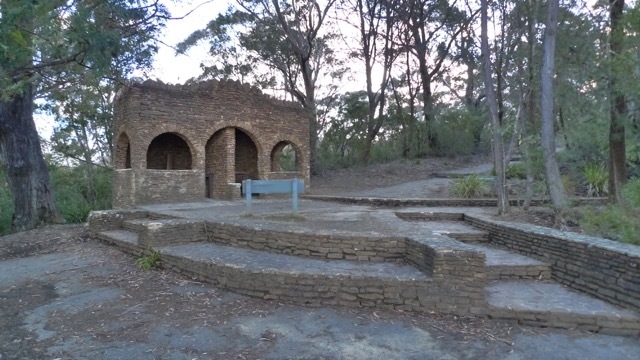 There’s a picnic area – tables and bench seats – just before the path crosses Banksia Streamlet and starts heading up out of the valley towards Leura township. 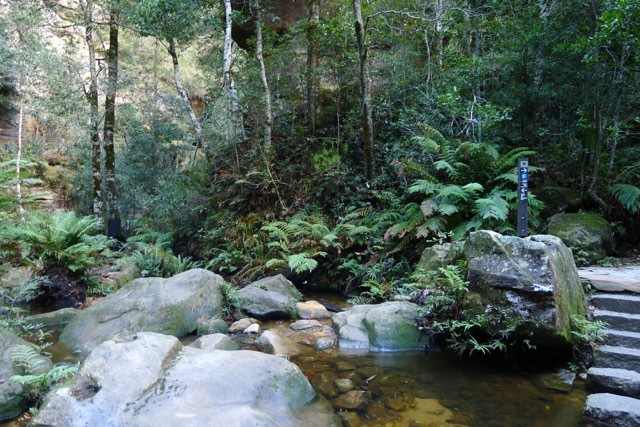 We crossed and walked on to the first set of stairs at the lower end of the Marguerite Cascades, where we stopped to watch another lyrebird before she moved on, and question whether we wanted to continue up to Leura or back via Federal Pass. I don’t remember exactly why now, but we decided to go back. 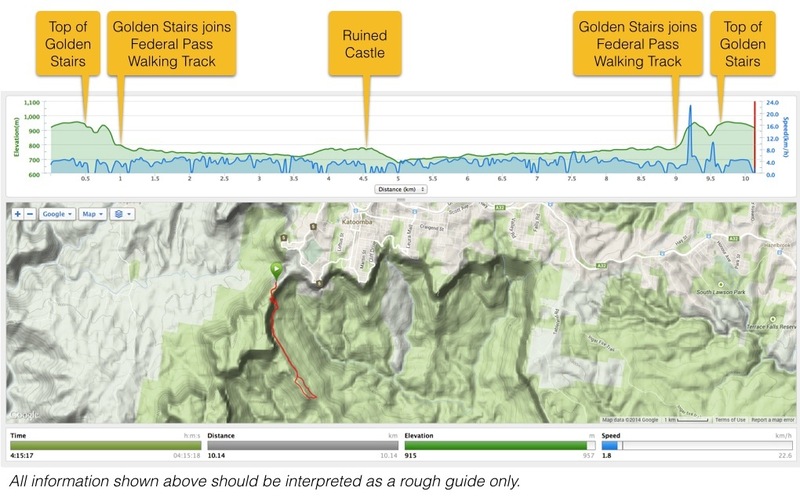 Federal Pass Walking Track drops almost immediately quite a bit lower down the hillside than the Dardanelles Track. It’s a very different walking experience; a more undulating track through a completely different habitat. Once again it was interesting to observe how different the forest can be just by moving a short distance away. Less canopy cover means more ground cover, so ferns galore in this spot! 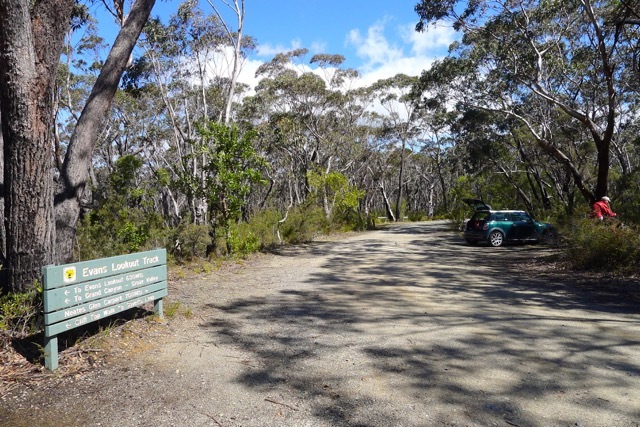 It was decision time again when we re-met the Dardanelles Pass Walking Track. 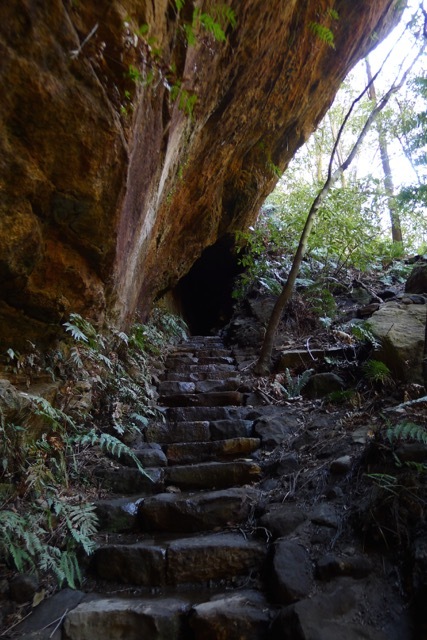 I confess it was more Stephen’s decision than mine to climb back up the Giant Stairway, but the alternative choice of walking around to Furber Steps or Scenic World was something we’d already done, so up we went! Stephen smiling encouragingly at the bottom of the Giant Stairway – but what choice did I have? The benefits of walking on a weekday and not during school holidays is the decreased likelihood of encountering other people – I was glad there wasn’t anyone coming down while we were walking up the 883 (per Stephen’s count) stairs. The first people we saw were at the bridge to the first Sister. There are plenty of people willing to walk the couple of hundred metres there from the Visitor Centre and get just a taste of the stairs. It was good to be back at the top, even though it meant being blown by the wind again. We took a short detour to Spooners Lookout, just for completeness. When we started that morning we were the only tourists at Echo Point; now the place was its usual bustling self. Do those people milling around the lookout have any clue about the wonders I’ve just seen and heard? Given we had finished this walk so early (it was still morning!) we had time to fit in another walk that afternoon. 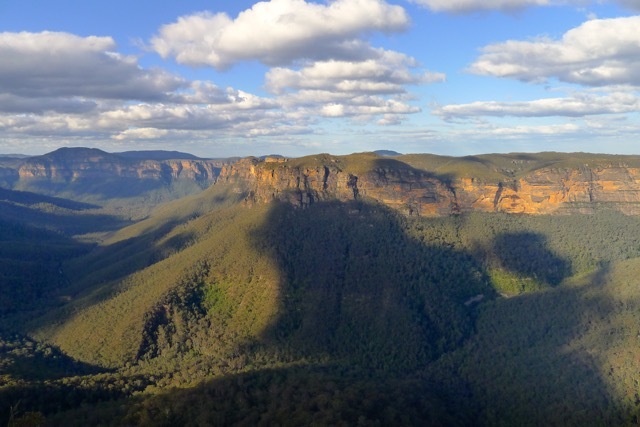 It would turn out to be the most stunning of our walks in the Blue Mountains yet! 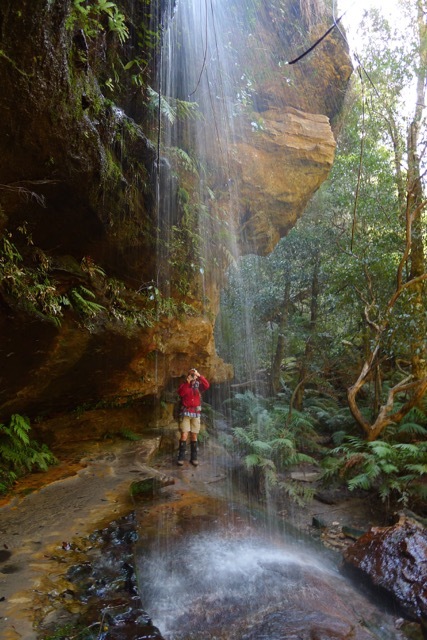 Categories: Hike, Holiday, New South Wales | Tags: Blue Mountains, bushwalk, bushwalking, Dardanelles Pass Walking Track, day walk, Echo Point, Echo Point Lookout, Federal Pass Walking Track, Ferns, fungi, Giant Stairway, Green Forest, Hiking, holiday, Jamison Valley, Katoomba, Laura Forest, Lyrebirds, Moss Forest, NSW NPWS, NSW Parks, Rock Warblers, Shinrinyoku, Three Sisters | Permalink. 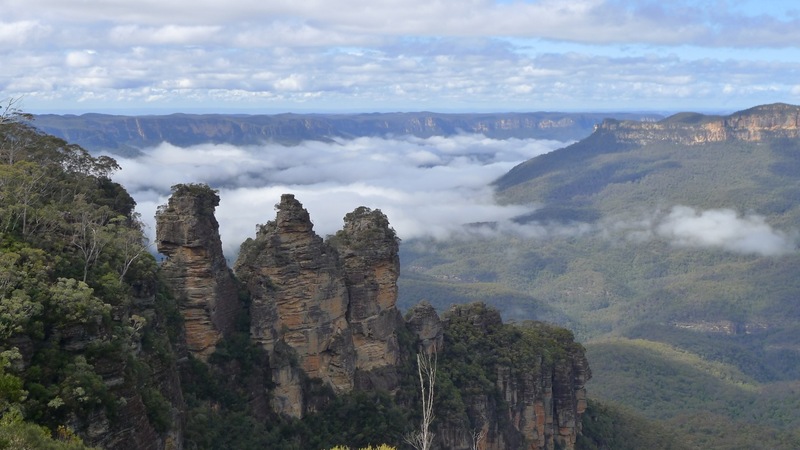 A short, to half-day walk for anyone of reasonable fitness and mobility who is visiting the Blue Mountains and wants to see some iconic sights. Accuracy not guaranteed! 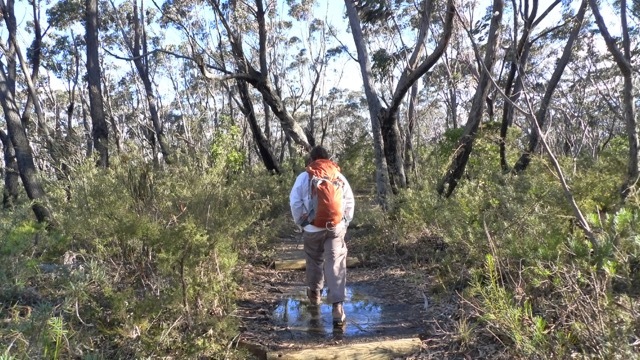 Ensure you are equipped with local knowledge (maps and weather forecast), appropriate attire and kit (including water) before starting your bushwalk. 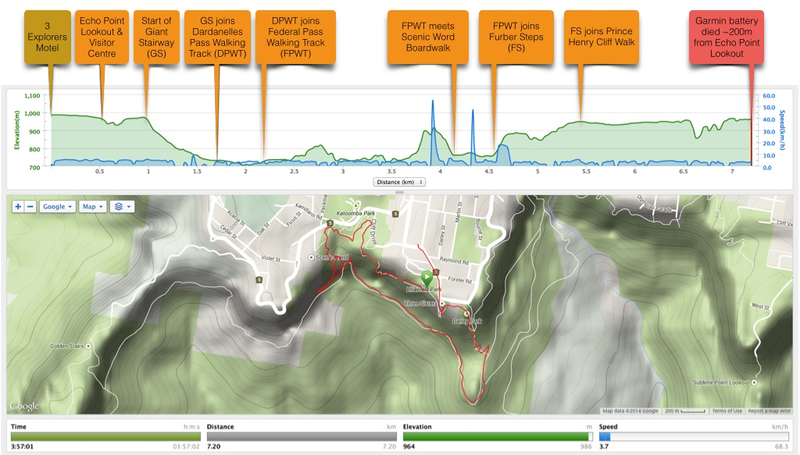 This was our first walk for our stay at Katoomba. Although armed with local knowledge, in the form of an SV Map and a Walking Track Guide for the Katoomba area produced by the NSW National Parks & Wildlife Service (both purchased from the Echo Point Visitor Information Centre), I felt like a new employee feels heading off to work on their first day: you know how to do your job (in this case, pack a backpack, dress appropriately and walk), but you’re not really sure what you’re going to encounter on your expedition. 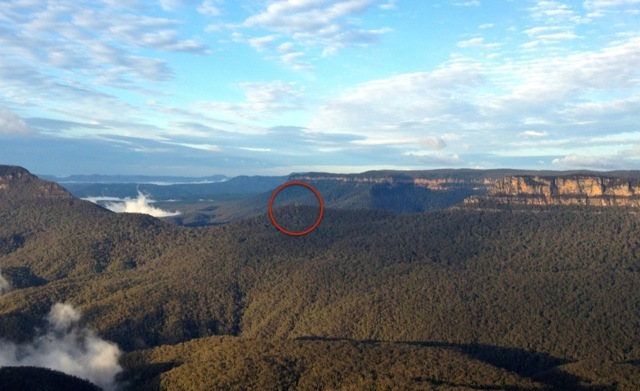 Our starting point was actually 3 Explorers Motel, approx 500m from Echo Point Lookout and Visitor Information Centre. After the obligatory photo of the Three Sisters from Echo Point Lookout, we headed back towards the Visitor Centre. 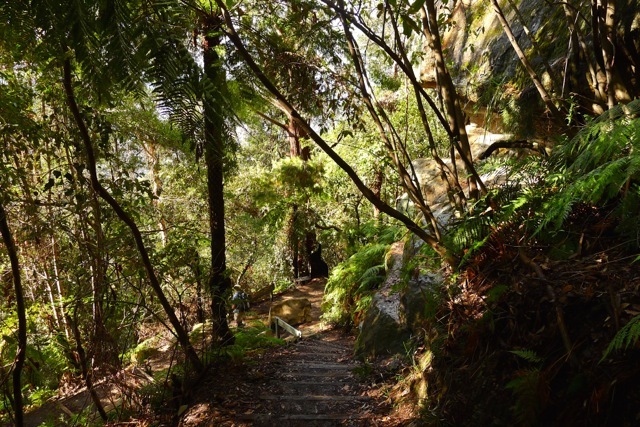 To get to the Giant Stairway you follow the Prince Henry Cliff Walk for a short distance. 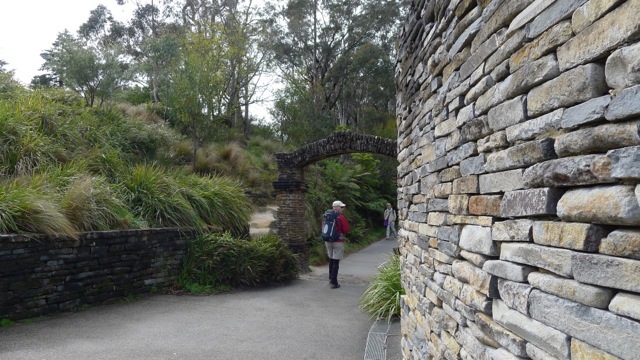 Pick up the path at the stone arch between the Visitor Centre and the public facilities. 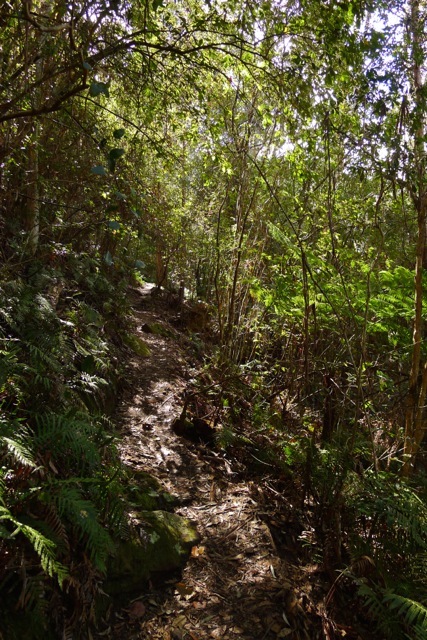 The track leading off to the right almost immediately is just a short walk (maybe 50m) to another lookout. 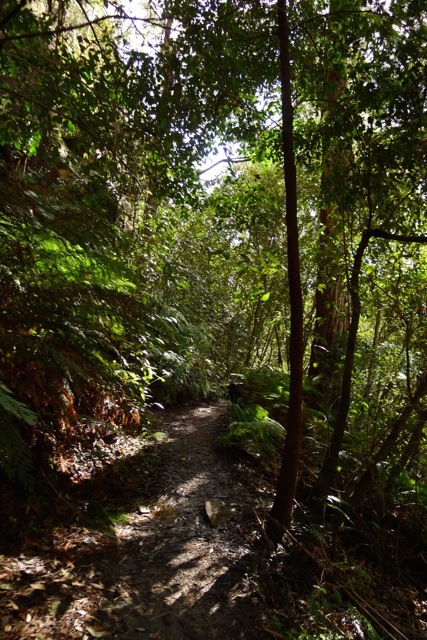 The path is quite beautiful along the ridge next to the banksia trees. The only shame is that so many people have chosen to carve their initials or unreadable messages into the exposed sandstone rock and any smooth-barked tree unfortunate enough to be located beside the path. The rock is really so lovely – cream coloured with maroon ribbons of much harder layers running through, I felt so sad to see the sooth stone used like the back of a public toilet door. Stephen offered another view – maybe in a few decades time these carvings will be valued as a glimpse of this time in history. Well, that’s one view I suppose. Vandalism or graffiti that may have value in the future? 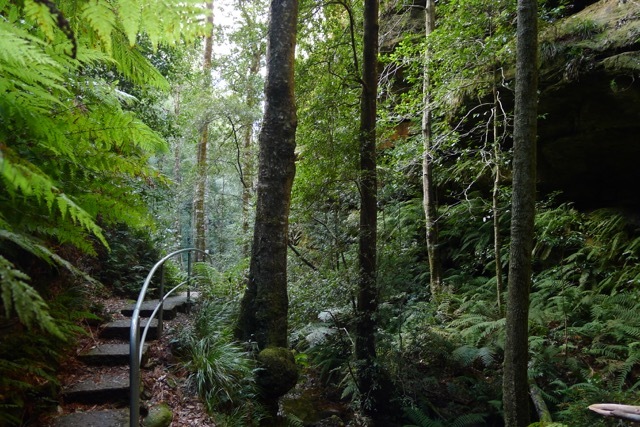 Roughly 400m from the Visitor Centre, the track to the Three Sisters and Giant Stairway branches off to the right. Just before you pass under another stone archway, there’s a sign asking people to remember to “Please take your rubbish out with you“. This is a National Park, but even if it weren’t, if you can’t find a bin for your rubbish, that is what you’re supposed to do anyway, right? Right? Pretty much as soon as you pass under the arch the steps start. There’s a plaque saying there are 900. Stephen counted on the way up a couple of days later and didn’t quite reach 900, but near enough. Many are natural stone that have been worn in the middle of the tread from countless footsteps. Despite being wet they weren’t slippery thank goodness, but I wasn’t taking any chances and kept one hand on the hand rail. Like when you’re a kid mastering a trick and call out to your mum to watch, and as soon as she does you stack it – I wasn’t going to let my guard down and use anything but my feet to descend, thank you. It’s steep enough – thank goodness for handrails! Today was the best day we had weather-wise; sunny but not hot, and not windy. Walking across to the first sister was a breeze, so to speak, but the staff at the Visitor Centre had warned about crossing when it’s really blowing a gale. The layers of rock are just fascinating. If anyone’s up at the lookout you can wave and possibly be in someone’s photo! I don’t think I made it into anyone else’s album. 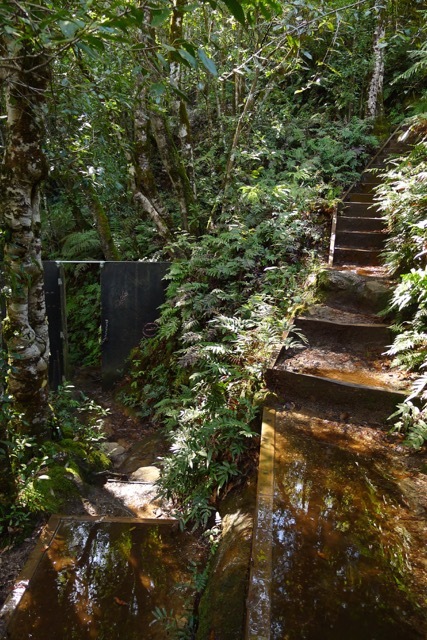 A good portion – half, if not more – of the steps are metal treads and look pretty new, although due to the steep gradient they’re often fairly narrow and one or two were a tad slippery. I can only imagine how much effort it took to put everything in – especially the railings, which seem jointless. 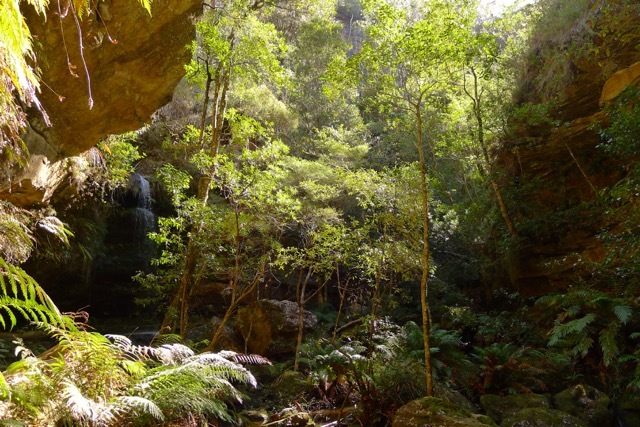 I take my hat off to the NSW NPWS staff who worked on this! Although you’re descending into the valley, the view is still good, so don’t forget to stop and look – and listen! The bird calls are fantastic! The dominant call we heard ringing up out of the forest below was the single chiming call of numerous Bell Miners (Manorina melanophrys), a medium-sized native bird, a little smaller than a Noisy Miner (Manorina melanocephala) which many people living in the eastern states of Australia would be familiar with. 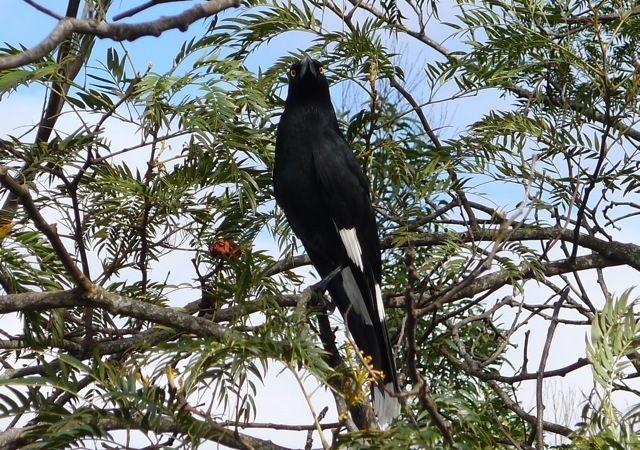 (For overseas readers, they’re about the size of a Common Starling, Sturnus vulgaris). About half way down, as I was pointing out rubbish in illogical places to Stephen, we came across a huge bag of rubbish that looks like it’s to be ‘choppered out. Wow. Ok, so I don’t know how long it’s been there, but if they can fill a bag like this and there’s still enough plastic bottles and wrappings around to make me think a collection is most certainly due… that’s incredibly disgusting. So much for the sign at the top, hey? ‘Take your rubbish with you’? Yeah, sure, a lot may be blown in, but that says to me it wasn’t properly disposed of in the first place. 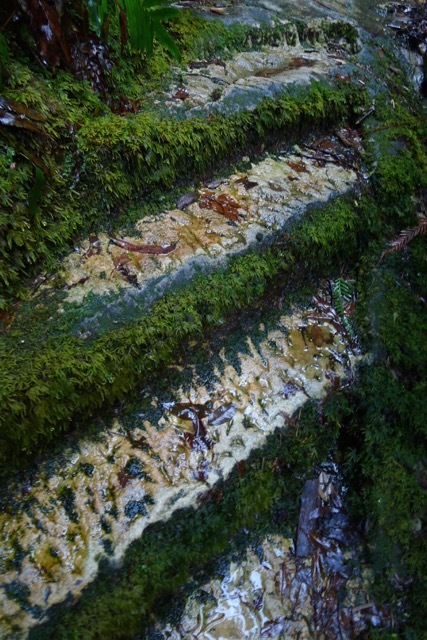 At the base of the stairs you’re on the Dardanelles Pass Walking Track. We turned right here and walked around the base of the cliffs that are the Three Sisters. 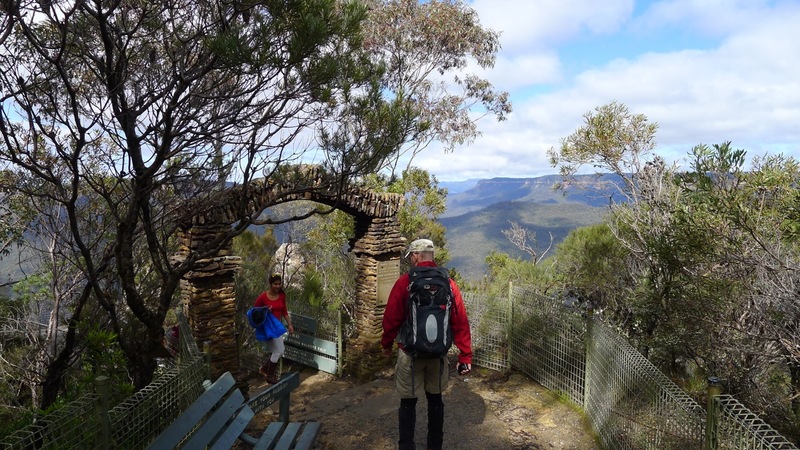 In about half a kilometre the track Dardanelles track joins the Federal Pass Walking Tack. 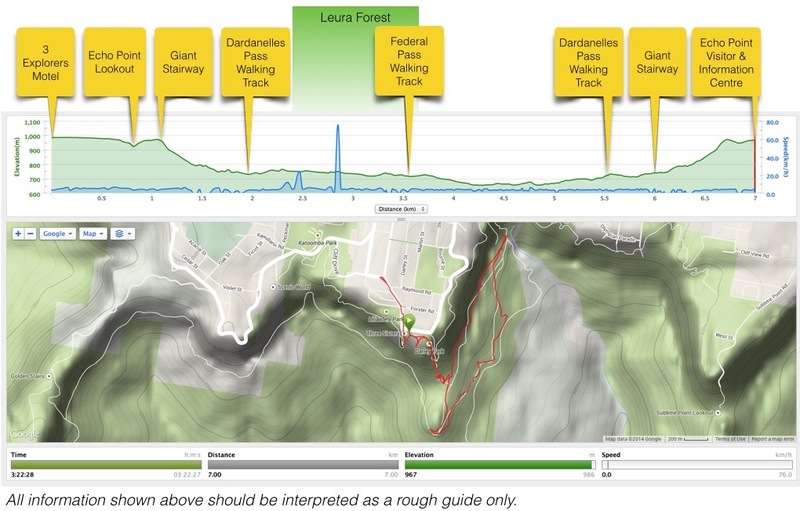 This section of Federal Pass Walking Track seems to get a lot of traffic. 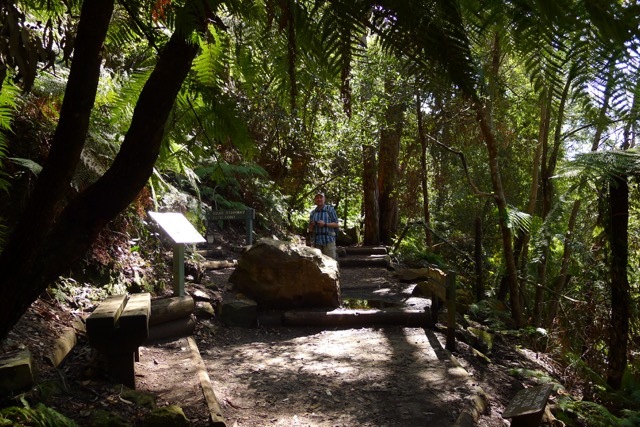 It’s easily accessible via Scenic World’s railway or cable car if walking down (or back up) stairs isn’t your thing, it’s well maintained and easy to negotiate for almost everyone. The downside of this accessibility is every smooth-barked tree is scarred with nonsense, and there’s rubbish where there shouldn’t be. 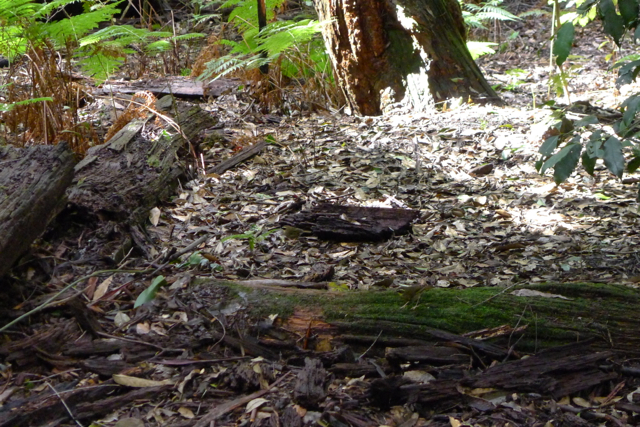 Was I glad to see a Brown Antechinus feeding on the path? Well, had it been eating an insect or lizard it had caught – yes, I’d have been stoked! As it was attracted by broken biscuit pieces someone had carelessly dropped (along with the packaging) I was less than thrilled. We aren’t walking lightly through our national parks, we’re stomping! Intentionally or not, we are changing the habitats and habits of our remaining wild paces and the species that live there. After a while the messages become unreadable, but why do it in the first place? Crumbs on the path that attracted the antechinus. There’s way too much litter in this photo. 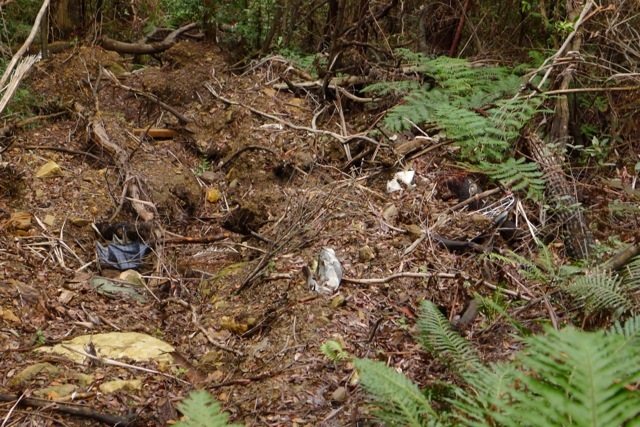 A shopping trolley, an umbrella, random pieces of large and small plastic junk, treated wood posts… it’s amazing what a small landslide can introduce into an environment like this. Soon enough we arrived at Scenic World. 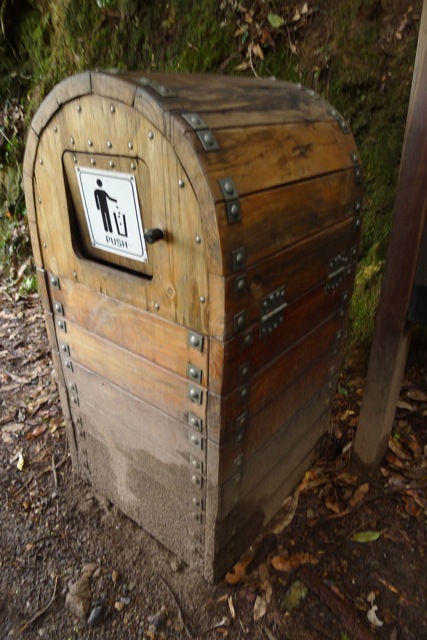 I was amazed to see they provided a rubbish bin at the entrance – which just proves my theory that most people will take the lazy option whenever they think no one’s watching them. 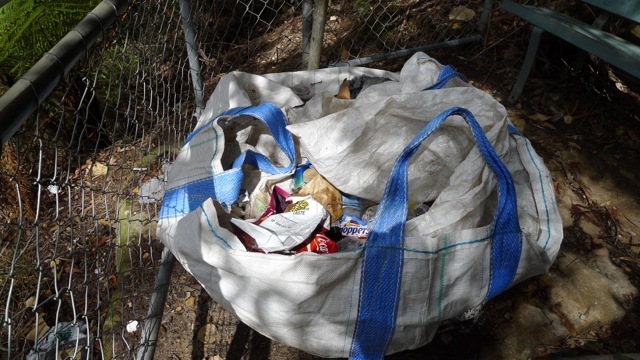 We disposed to the bits of rubbish we’d picked up off the path along the way – not everything we came across – we didn’t come equipped with giant garbage bags after all. Now we were at Scenic World’s ‘scenic walkway’ it was time to make a call on whether or not to catch the railway back up. Everyone I know who’s been on it raves about it. Yes it looks steep and a fun ride, but at $14 per adult for a one-way trip… we watched the ‘train’ arrive and set off again, had a short look at the old coal mine entrances as you venture along the boardwalk, but quickly lost interest since there’s not much information there and there aren’t tours going in. After watching a second exchange of passengers on the railway, we retraced our steps to where the Furber Steps join Prince Henry Cliff Walk above with Federal Pass Walking Track below. We’d decided to walk up. A good call, if I may say so myself. 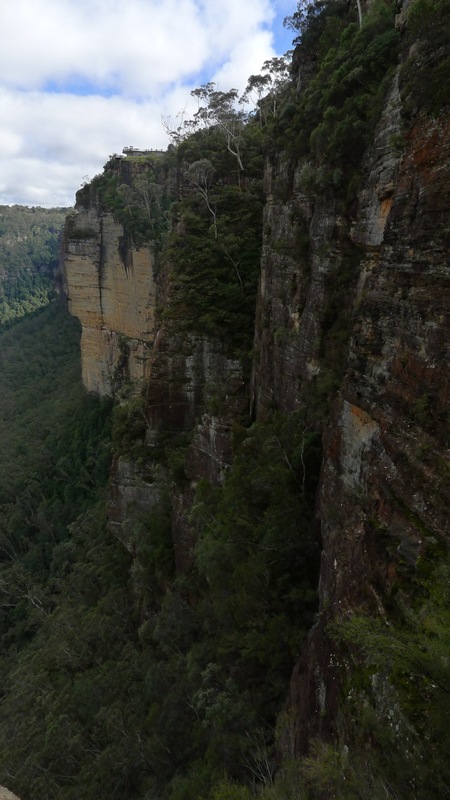 The Furber Steps aren’t nearly as numerous (~700) or as steep as the Giant Staircase, and you get to enjoy views of Katoomba Falls (for free! ), Vera’s Grotto and Witches Leap (‘leap’ being a Scottish word for ‘waterfall’). Oh, and other tourists seem to quickly vanish from view. Strange that. Rejoining the Prince Henry Cliff Walk at the top, I was struck by how distinct the boundaries between the different ecosystems are in the area. 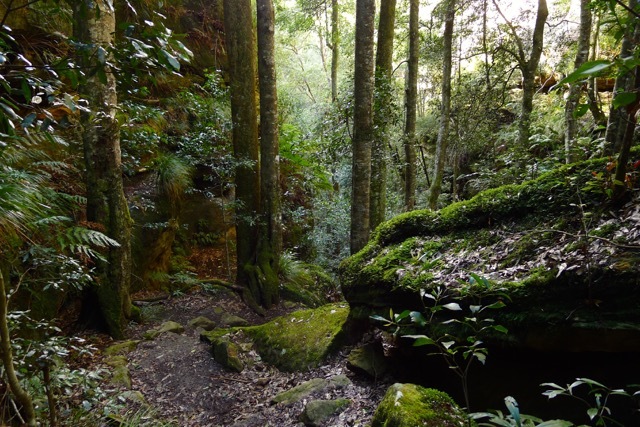 Approaching Katoomba Cascades is different to the cliff tops, which seem in complete contrast to the lush valleys with their heath scrub growing out of grainy yellow soils. Because there had been rain recently there were puddles on the track. Some were large puddles. And when puddles form on dirt tracks, you get mud. Unfortunately for the many tourists who arrive by coach and decide to take a stroll along the cliff (no doubt having been told it’s an easy walk – which it is), they usually come unprepared for mud. Call me heartless if you wish as I freely stride past in my hiking boots, but we see examples of woefully unprepared tourists almost every time we go for a walk. I don’t know why I felt the return cliff top walk seemed to go for ages. Maybe it was the people. Maybe it was just me. 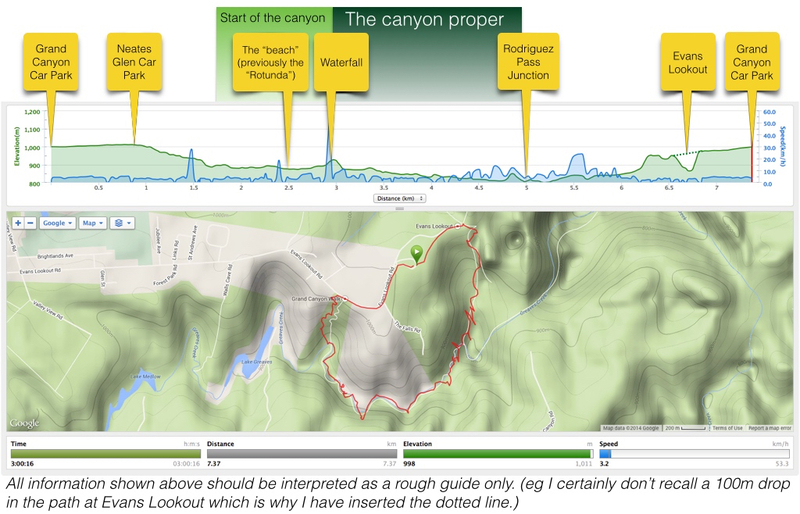 The graph at the very top stops short of the end as Stephen’s garmin ran flat…and I haven’t uploaded my data yet. I wasn’t sure we’d get any usable walk info actually because on all the walks we did they kept beeping to say they’d lost satellite connection. Well, that’s what you get when you’re walking in forest at the base of tall cliffs! You might also have noticed that we weren’t exactly breaking any speed records. That’s never the case when my camera’s in hand! It’s a bit of a trade-off between burning more calories and really seeing more of what’s around me. I find that when I have a camera in my hand I look at the world slightly differently, like I’m looking through an imaginary lens. I’m not the only one, I hope? I know some people say they can only take in and appreciate a moment without being distracted by cameras and the like. I’m the opposite. If I haven’t photographed it – or imagined photographing it – chances are I won’t remember it. If you’ve got no time for anything else, then why not do this one! If you don’t stop to take as many photos as we did, or watch the railway come and go, you can cut down the time by a fair bit and take a wee bit off the length, too. 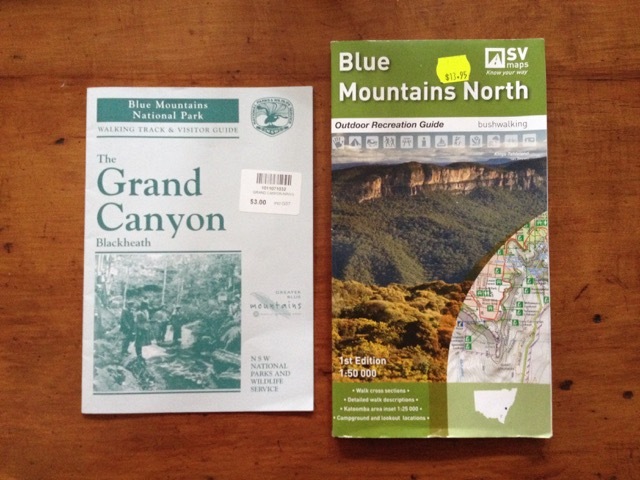 Categories: Hike, New South Wales, Weekend walks | Tags: Bell Miner, Blue Mountains, Bush walk, bushwalking, Circuit walk, day walk, Echo Point, Echo Point Lookout, Federal Pass Walking Track, Furber Steps, Giant Staircase, Hiking, Jamison Valley, Katoomba, Katoomba Falls, NSW NPWS, Pied Currawong, Prince Henry Cliff Walk, Scenic World, SV Maps, Three Sisters, Waterfall | Permalink.